To commence the celebrations for the 150th Birth Anniversary of Mahatma Gandhi across India and the globe on 2nd October 2018, the Embassy in Ljubljana will be organizing an LED projection on the facade of Chancery building at Železna cesta 16 in Ljubljana. The four-minute projection contains highlights of the initiatives and lessons from his life that are relevant and applicable in today's times which inspires our generation to be a better version of themselves. The projection will run from 1930 hrs onwards on 2nd October 2018. · Release of the video of the Bhajan (Devotional song), Vaishnav Jan Toh Tene Kahiye Je, sung by Slovene artists, Ms. Ana Vipotnik and Mr. Igor Leonardi. Mohandas Karamchand Gandhi (2nd October 1869 – 30th January 1948) was one of greatest leaders of the modern world, who with his unusual yet powerful political tools of Satyagraha and non-violence, inspired several political leaders and movements for civil rights and freedom across the world. On 15 June 2007 the United Nations General Assembly declared the birthday of Mahatma Gandhi on 2 October as the International Day of Non-Violence. 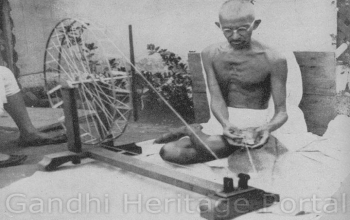 The 150th Birth Anniversary of Mahatma Gandhi will be celebrated on 2nd October 2019.